You've probably heard about the debt crisis in Greece. You've probably heard about the referendum and how the Greek people voted to reject the terms being pushed onto them by the Eurogroup. You've probably heard people speculating as to whether Greece will be forced out of the Eurozone. However there are several important variables in this crisis that most people aren't talking about. The Greek debt in question is only worth about €300 billion. The Spanish debt on the other hand currently stands at over a trillion, and the Italian debt stands at 2.6 trillion. These are the big scary numbers - although it's still regularly mixed up with the deficit by journalists and politicians alike. As a whole, Europe owes €10,840,197,700,000 - or €10.84 trillion to the private bankers. But it's more meaningful to look at the number as a percent of gross domestic product, or GDP. So, we want to see how much that debt is as a proportion of the whole economy - kind of equivalent to measuring your mortgage compared to the whole economic value of your household. That gives us a European average of 84.9% in the second three months of this year - up from 83.4% in the first quarter. But that figure hides a lot of variation: Greece, at the top, owes 144.3%, up from 132.3% (although it has seen big GDP drops over the same period), followed by Italy at 126.1%. The UK is just above average at 86%. There's nothing inherently bad about having a huge debt - it depends who you owe it to and whether you can manage the payments. Bigger countries are also in a better position: essentially, if you owe the bank £50,000, you've got a problem; if you owe the bank £50,000,000, the bank's got a problem. Global contagion is a real risk, and not just because of Greece. China's stock market has lost over 30% of it's value in three weeks, with total losses currently standing at over 3.7 trillion dollars. At this point even mainstream investors like Carl Icahn are warning that the U.S. stock market is in a massive bubble. The thing about bubbles is they tend to look for an excuse to pop. Central bankers may not able to stabilize markets in the next leg of the crisis. The Federal Reserve never actually tightened monetary policy. The 4.48 trillion dollars in bonds that they bought out between 2008 and 2014 are still on their books and they have been rolling these investments over as they mature. And the Fed's zero interest rate policy is still in force, in spite of hints that they may raise rates later this year. 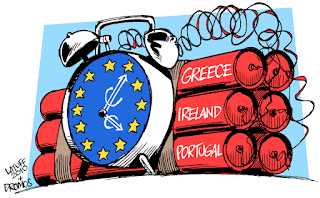 In the short term, Greece is headed for some rough waters no matter how the negotiations proceed from here. The Greek banking system will not be able to function without outside help, and outside help hinges upon an agreement with creditors, who don't seem very eager to compromise at this point. The banking situation is already interfering with imports and exports. This in itself will have consequences if a deal is not reached quickly. If chaos follows, there will be a fierce battle to control the narrative. 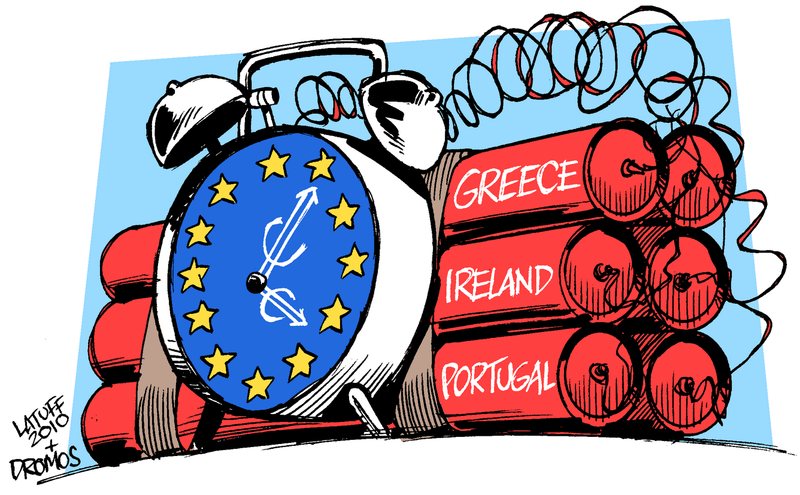 The rhetoric from the Eurogroup is predictable. 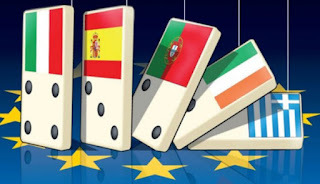 At each phase of the crisis they have insisted that the solution to the problems created by the E.U. is to move towards full political and financial integration. In other words: they screwed up because you didn't give them enough power. Where have we heard that before? Remember that your debts are created out of thin air by private banks (see our presentation) and, apart private banks are privately owned, but most, if not all Central Banks in the world are also privately owned? That include Bank of England, World Bank, the ECB, IMF, The Federal Reserve, etc, ... The majority shareholders are bond holders, the GRAY Masters Illuminatists who control the Jesuit Order followed by the Black Nobility and the Royal families worldwide. We are all their slaves and our so called elected or unlected government are their puppets, no-one serving us, the people. They create currency out of nothing and they use THE PEOPLE, you as collateral. You then borrow from them and they charge you interests on what they created out of nothing. That's include your mortgage, your car loan, even every credit card payment transaction is automatic digital currency creation and each time you reimburse your credit card debt, that amount of currency disappears. In any normal summer, a 30pc fall in the Chinese stock market – a loss of value roughly equivalent to the UK’s entire economic output last year – after an ascent which had seen share prices more than double within the space of a year would have been front page news across the globe. The dramatic series of government interventions to stem the panic – hitherto unsuccessful, it should be added – would similarly have been up there at the top of the news agenda. Yet the pantomime of the Greek debt talks, together with the tragi-comedy of will they, won’t they leave the euro, has relegated the story to little more than a footnote - even though 940 companies, more than a third, have now suspended trading on China’s two main indices. The parallels with 1929 are, on the face of it, uncanny. After more than a decade of frantic growth, extraordinary wealth creation and excess, both economies – America in 1929 and China today – are at roughly similar stages of economic development. Both these booms, moreover, are in part explained by extremely rapid credit growth. Indeed, China’s credit boom dwarfs that of even the “roaring Twenties”. Borrowed money, or margin investing, played a major role in both these outbreaks of speculative excess. True, the Chinese stock market bubble is only a one-year wonder, whereas the build-up to the Wall Street Crash of 1929 was more sustained. Even so, the comparison still holds. As noted by JK Galbraith in his classic account, The Great Crash 1929, even as late as 1927 it was possible to argue that American stocks represented fair value. It was only in the final year that the “escape into make-believe” happened in earnest, when the stock market rose by nearly 50pc. This applies to the Shanghai Composite, too. Stripping out the lowly-rated banking sector, valuations for just about everything else have rocketed, making those that ruled on Wall Street in the run-up to October 24, 1929, look relatively modest. Nor do the similarities end there. As in 1920s America, China’s stock market boom has ridden in tandem with an equally speculative real estate bubble. The macro-economic backdrop is also surprisingly similar. Then, as now in China, rural workers had emigrated to the cities in vast numbers in the hope of finding a more prosperous life in fast-growing industrial sectors. In 1920s America, virtually all these sectors – from steel to automobiles and the new technologies of radio and consumer durables – grew like Topsy, inspiring households to invest in them and chase the apparently bountiful profits they were generating. A similar explosion in industrial activity has taken place in China, only more so. China has packed more development into a few short decades than any country in recorded history before, creating a worldwide glut in industrial capacity that even global demand, let alone domestic Chinese demand, is struggling to accommodate. Already, there are warning signs of a slowdown, similar to those that front-ran the 1929 crash – depressed commodity prices and a virtual hiatus in global trade growth. The Chinese economy is like one of those cartoon characters who manages to keep running long after leaving the edge of the cliff, only belatedly to look down and plunge into the abyss. Naturally, there are many dissimilarities too, not least that China is still essentially a planned and centrally-controlled economy which has so far managed to defy the usual rules of economics. The consensus is that this time will be no different, that even if the stock market does continue to crash, the impact will be no worse than 2007-08, when the Shanghai Composite fell by two-thirds. Yet after a massive fiscal and monetary stimulus, the wider economy barely lost a beat. Have no fear, the Chinese authorities have it all under control. Believe it if you will. I don’t buy it. Indeed, I can see very little evidence for China’s technocratic elite having things under control. The firebreaks that China put in place over the weekend to mitigate the panic are, in practice, not much different from those applied during the Great Crash of 1929, only this time it’s public rather than private money that promises to quell the fire. They failed spectacularly in 1929. This time around, they’ve thrown the kitchen sink at the problem, but so far it has produced only a mild, and wholly unconvincing, rebound. The fire still smoulders, threatening to break out anew. Besides, China cannot forever, Greenspan-like, keep answering each successive bubble by creating another. First it was gold, then housing, and when cooling measures threatened an all-out bust in the property and construction markets, the taps were turned on afresh, producing a further flood of money into the stock market. The authorities were happy to tolerate the bull market at first, hoping it might encourage a switch from debt to equity financing, but there seems little chance of that now. The stock market boom has only succeeded in adding to the debt. Whether any of this turns into a calamitous economic meltdown obviously depends on the rest of the response. Policymakers have learned a thing or two since 1929; we now know that the real damage in financial crises is done not by the crash itself, but by a collapsing banking sector. Stock markets are only a signal of credit contraction to come. Even so, I doubt China has as much of a handle on its banks, and more particularly its shadow banking sector, as it pretends. One further thought on these parallels. Now that the export-led model of economic of growth seems to have reached its natural end, at least for China, president Xi Jinping pins his hopes on internal consumer demand to drive growth, and he’s vowed to continue with the free-market reforms of predecessors to help achieve this. Unfortunately, it’s proving a difficult transition. Part of the problem with free markets is that by definition they cannot be controlled. Busts are as much part of their DNA as the wealth-enhancing properties of their booms. As China is about to discover, bad downturns come with the territory.